Pennsylvania's entry occupied a conspicuous position on elevated ground, and was a two-storied 226 x 105 foot wide structure- somewhat suggesting the State Capitol that cost 75,000 dollars. The most imposing feature is a magnificently proportioned rotunda, with a colonnade of Ionic columns. Twelve semi-circular arches, each containing an allegorical painting, surmount an entablature of great dignity. The color scheme is ivory white and gold. On the first floor were rooms for ladies and one for gentlemen, a rotunda, a reception room, smoking room and package room. Native woods and marbles were effectively used in the interior decorations and furnishings. The second floor had three large "art rooms" and a retiring room, with an attendant, for the convenience of mothers and infants. Also, reading rooms and office apartments completed the rest of the top story. There was a great collection of founding fathers oil paintings displayed including William Penn. The ladies' room contained some beautiful furniture, consisting of some large settees, tables, writing desks, and comfortably upholstered easy chairs. The windows were draped with red silk curtains on which were embroidered the coat of arms and other state emblems. 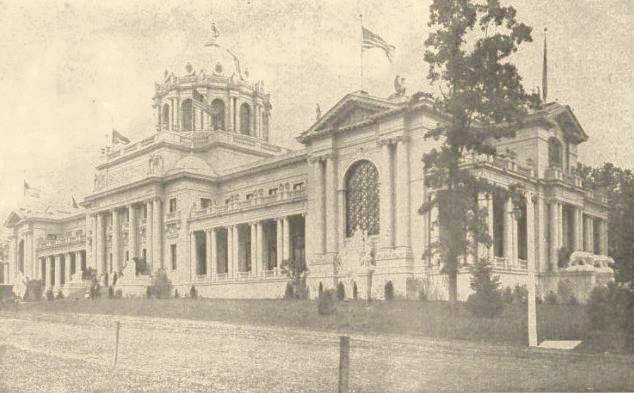 There were no exhibits in the Pennsylvania State Building outside of the portraits of distinguished Pennsylvanians, past and present; 42 of which were displayed, and a collection of pictures loaned by the American Art Society. Several mural paintings from the Women's School of Design, in Philadelphia, and a series of nearly 100 photographs of the monuments erected to Pennsylvania regiments on the field of Gettysburg. In one room was an urn covered in 4,000 coins including some from 3,000 BC. Stationed in the center of a rotunda and protected by a honor guards was the famous Liberty Bell. The walls above the low wainscoting were painted in a rich shade of turquoise blue, with paneled ornamental stenciled work of a very rich ecru tone. On July 4, 1904, 50,000 booklets describing the history of the Liberty Bell were handed out by 7 local school children. It was Pennsylvania-made machinery which furnished the power for the electric lights of the Exposition, as well as for driving the machinery and pumping the water for the Cascades. At the Palace of Education, the Haverford College and Lehigh University had exhibits of photographs of the college buildings, interiors, course of study, and students. The Philadelphia School of Design for Women, the Pennsylvania School of Industrial Art, and the Spring Garden Institute had most interesting exhibits showing the best handiwork in the lines for which these schools were severally noted. There were also over 3,000 photographs of school buildings, and children at work and play. In the Palace of Mines and Metalurgy, the state's central exhibit was an octagonal shaft about 30 feet in height, surmounted by an ornamental frieze, dome, and golden eagle, bore statistics relating to the most important mineral productions of the state during the year 1903. Also shown- a piece of anthracite coal weighing 11 tons, said to be the largest unbroken piece of this coal ever taken from the ground. 313 works of art, including Pennsylvania sculpture from the late Edmund C. Stewartson, "The Bather was displayed. The state has many other exhibits in a variety of palaces.